Washington Post called itself "America's New Publication of Record" on Wednesday. Shots fired, New York Times. 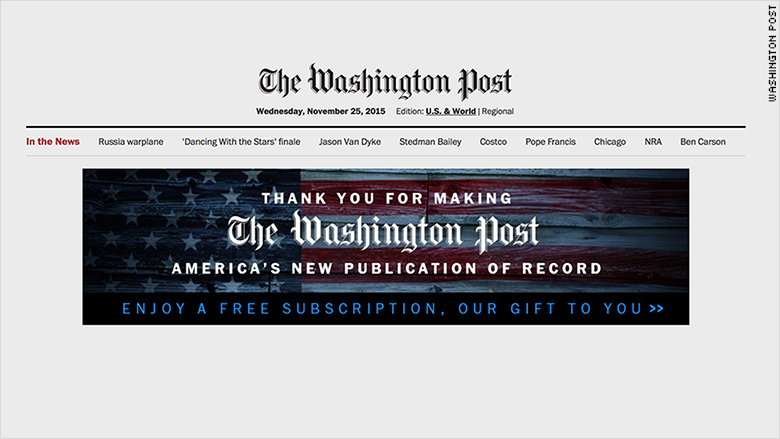 Readers who went to the Washington Post website Wednesday were greeted with a banner ad by the Post that had the paper thanking them for making it "America's new publication of record." A big statement by the D.C. news outlet seeing that the unofficial "paper of record" has long been the claim of the New York Times. The statement was met by Times reporters on social media with a mixture of surprise and a bit of sarcasm. "Staying with the theme of 'simply saying things makes them true,' I'd like to congratulate myself for being the most attractive man on earth," tweeted New York Times tech reporter, Mike Isaac. Other Times reporters responded with simple phrases like "Ha!" "Oh, so it's on?" tweeted Times TV editor Gilbert Cruz. The claim comes just one day after Washington Post owner Jeff Bezos told Charlie Rose on "CBS This Morning" that the Post is "working on becoming the new paper of record." "We've always been a local paper, and just this month The Washington Post passed The New York Times in terms of number of viewers online," Bezos said. "This is a gigantic accomplishment for the Post team. We're just going to keep after that." Bezos said the Post has stood out thanks to the "talented team" at the Post who are focusing on "quality journalism." To some New York Times employees, it appears that Bezos was in a hurry to claim mission accomplished. "Yesterday Bezos said his goal was for WaPo to become the 'new paper of record,'" Alastair Coote, a member of the Times' interactive news team, tweeted on Wednesday. "Well, apparently that was quick." The New York Times did not immediately respond to request for comment on the Post's new claim.